From a marketing perspective, you’ve got to feel at least a little sorry for SeaWorld for the utter devastation of its sterling brand. For decades, its parks were a fun, wholesome place to take the kiddos. Then, the movie Blackfish ruined our collective joy from watching Shamu shows, and SeaWorld has been in PR damage control mode ever since. Managing corporate reputations is tricky in the modern era, as SeaWorld proves. That’s why you must take your company’s brand integrity into consideration in everything you do, including your search engine optimization efforts. SEO is all about boosting your company in search engine rankings, but you can’t step all over your brand during the climb. Too many companies use stale and icky SEO tactics to reach for the coveted first page of rankings. Google is way too smart at this point to reward black hat SEO practices, but bad SEO can also taint a company’s brand. To avoid shredding your brand’s values in the process, employ “white hat” SEO practices instead. It’s natural to assume that the more places you paste your content, the better. So why not try to throw your latest blog post against every conceivable online wall to see if it will stick? After recent updates, Google’s algorithms are extremely adept at identifying duplicate content (even if you tweak a few words here and there). It doesn’t want to give equal SEO juice to the same content over and over, so it may not index the page at all or even punish sites that host duplicate content. Focus on consistently generating new, unique content instead of posting the same old stuff over and over again. Each piece of new content has the opportunity to show up in search engine rankings and will give your audience new ways to engage with you. Recently, we worked with a company called Eyefi, which makes wireless SD cards, to help boost interest in its brand. Because SD cards are often used in cameras, the brand started profiling talented photographers on its website. It’s a fun, visually compelling series that makes it easy for Eyefi to keep producing fresh content. Links have always been an important component of a solid SEO strategy. The thinking used to be that the more backlinks, the better, which gave rise to link farms and pay-for-link schemes—a house of cards that quickly came falling down. These days, Google will penalize your site if you receive too many backlinks from poor-quality sites. What’s more, users won’t be likely to discover these links if they’re located on poorly designed sites stuffed to the gills with other links. Don’t be scared to cultivate backlinks; just make sure you do it in the right way. Reach out to quality websites, and look for opportunities to partner in authentic ways that lead to the legitimate sharing of links. If you focus on creating excellent content that serves your readers, they will reward you by sharing your content across their channels, which will naturally generate backlinks. Can you hear “Taps” playing? That’s because the era of SEO keywords is dead. This is a good thing—when search engines focused on keywords, it became all too common to see terrible content bloated with keywords. This made for worse user experiences and damaged reputations. Today, if you inflate your articles with the same duplicate keywords, don’t expect to see their rankings climb any time soon. Search engines still care what your content is about, but they’ve become much better at understanding themes rather than counting keyword repeats. Quality matters, and it always will. You can’t go wrong by focusing on creating content that’s relevant to your specific business. Seventy percent of consumers check out company or product reviews before making an online purchase. It’s no wonder, then, that some practitioners of black hat SEO regularly create fake profiles to post falsely positive reviews or to drum up support for their companies and products through social media. Review websites like Yelp and major retailers like Amazon are getting better at catching these fake reviews. 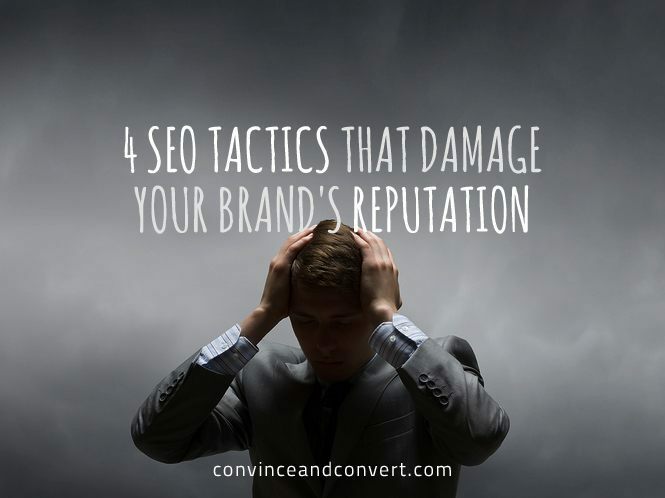 Your brand’s reputation will take a major hit that it may not be able to recover from if you get caught. Seek out and develop relationships with brand advocates and influencers (i.e., real people) who already love your product and are happy to gush about it to their audiences. Oftentimes, you can get enthusiastic reviews or mentions simply by offering free samples to bloggers, YouTube stars, and well-known personalities within your space. There’s no better way to boost your reputation than to step back and let someone else—who possesses authority and the trust of your target consumers—sing your brand’s praises. With 80 percent of consumers searching for a product or service before purchasing, potential customers may be looking for you right now. What are they going to find? If you focus on creating fresh, quality content that’s useful, informative, and entertaining, your site will be an SEO superstar. In SEO, as in life, strong reputations build strong bridges. Taking shortcuts, cheating, or lying is the fastest way to burn those bridges and lose your reputation and your customers forever. Tony Delmercado is the founder of 1099.me, the COO at Hawke Media, a passionately curious entrepreneur, and an all-around solid dude. He enjoys building businesses, playing golf, improving his Krav Maga and jiujitsu game, writing, studying business tax loopholes, and eating Mexican food. He spends his weekends at the T&A Bungalow in Chesterfield Square hanging with his lady, Anthea; his son, Onyx; and his dog, Naz.